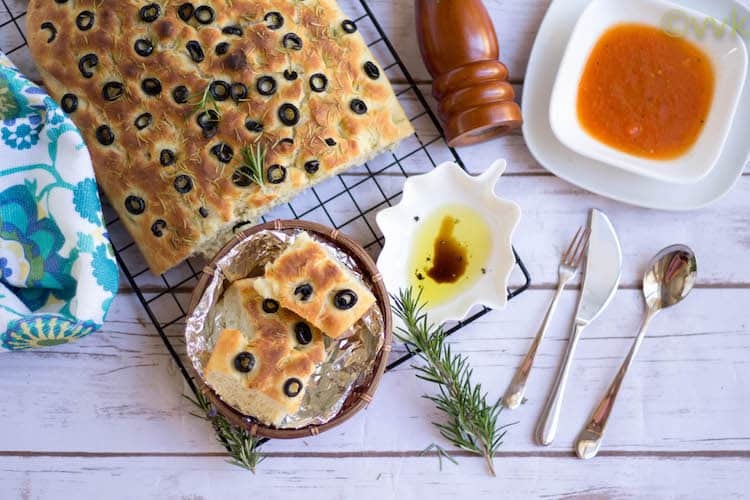 To put in simple words, Focaccia is flat Italian bread with different toppings. It’s pretty similar in style and texture to pizza doughs, but it’s comparatively crunchier as we add a lot of olive oil here. Oh yeah, olive oil drizzle before baking makes a huge difference. :-) This time the dough raised double in 1.5 hours. I used canned olives and dried rosemary for the topping. 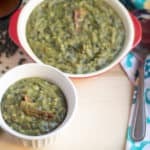 I have tons of rosemary bushes in my front yard, and those are Tuscan Blue rosemary variety, and I have never tried them in my cooking. 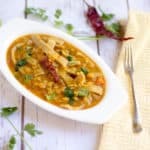 Before adding those to my bread recipe, I wanted to try them in soups and potatoes to know their taste better. 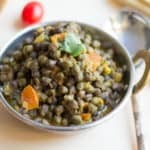 As Rosemary has the stronger flavor, I did not dare to experiment my fresh one with this recipe and hence went with the dried ones. While the yeast is doing its magic, in a wide mixing bowl sieve the flour, salt. Grease a big vessel with sufficient room for the dough to rise with olive oil. I kept it inside my oven. It took me 1.5 hours this for the dough rise. Coat a baking tray with olive oil and transfer the dough to the bakeware. Apply some oil on your fingers and press out the dough to a rectangle. Now press fingertips all over the dough forming indentations. Let this dough rise for about 20 to 25 minutes. Meanwhile, preheat the oven to 475 deg F and bake the bread for about 20 minutes or until it is brown and crusty. 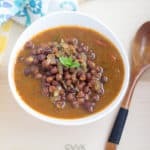 Let it cool and serve with olive oil and balsamic vinegar dipping or with soup. After the first rise, you can knead the dough and let it rise again before pressing out the dough for baking. You can choose your favorite topping. You can go for cheese, and sun dried tomatoes or tomato and basil or other Italian herbs too. 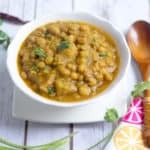 I would prefer plain extra virgin olive oil for this recipe (that’s what I used too), but you can opt for flavored oil too. A rustic yeast based bread recipe from Italy. 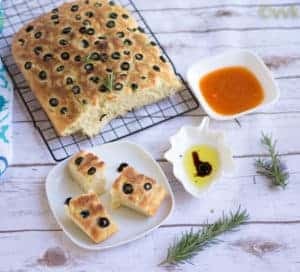 It’s the Focaccia al rosmarino - Focaccia bread with rosemary and olives. 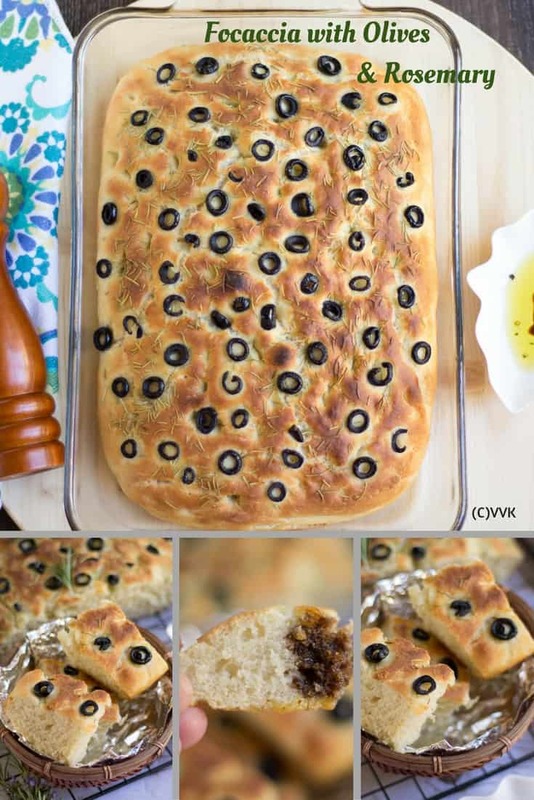 Drizzle and spread the olive oil on top and sprinkle the olives and rosemary evenly over. I love olive focaccia and your turned out super amazing. Another lovely bake from you!! 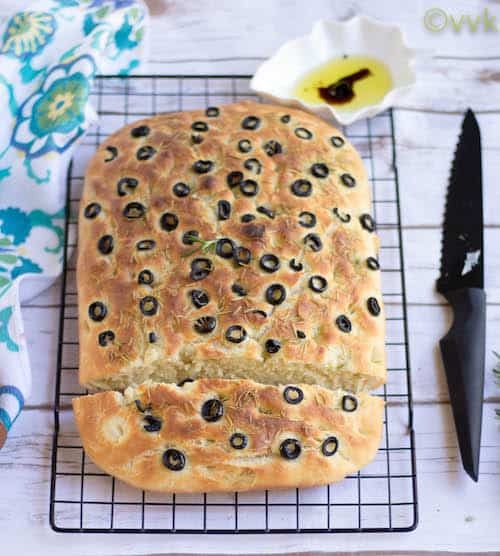 That golden crust and olives is an absolute stunner in Foccacia!! Such an inviting bread you got there!..looks so sinful! 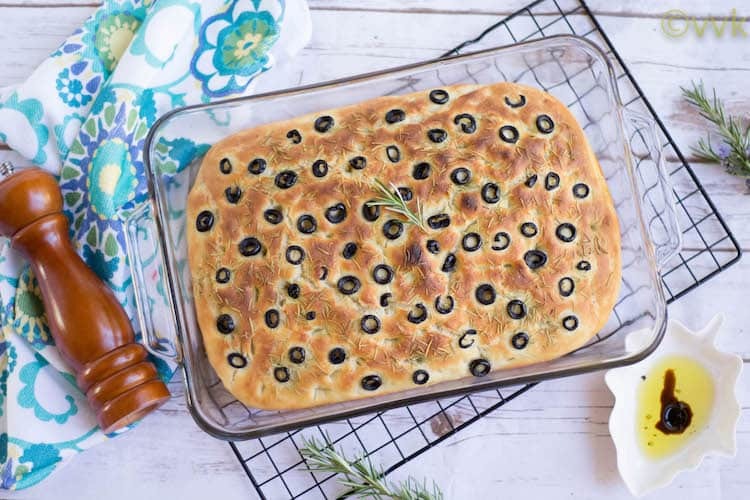 The olive studded focaccia is a beauty and a feast to the eyes. How beautiful this looks and love the texture of your bread. 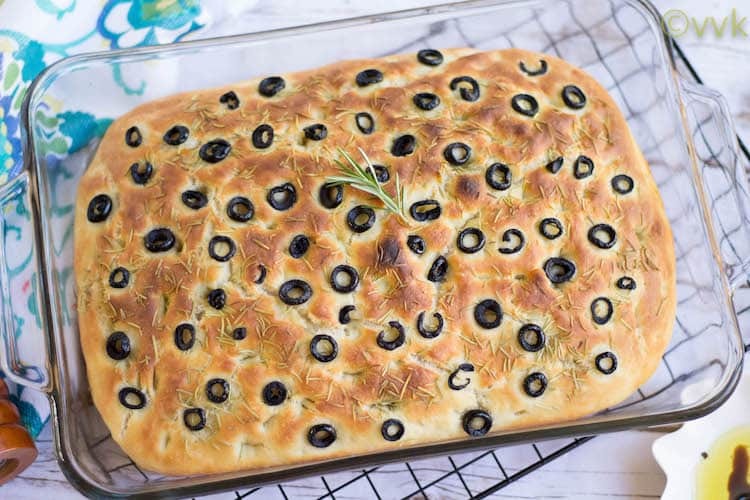 Wow, wat a gorgeous looking focaccia and those olive and rosemary topping makes this bread more attractive and stunning. Your bread looks simply fabulous Vidhya. What a beautiful Focaccia..awesome texture and the clicks are pulling me to make some bread right away, This happens to be a common bread but most wanted. Lovely ! Oh yeah very true. 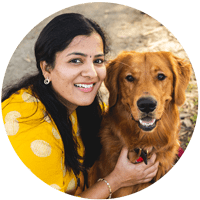 Thanks Vaishali. That’s a very authentic looking Focaccia! Love the olives dotted all over.. beautiful rise too. What a gorgeous looking focaccia Vidhya. It looks amazing. Same pinch! The Olive and Rosemary is the classic one. Lovely color and texture!